It was a cutout cardboard car packaged in plastic with a foldover card label bearing an uncanny resemblance to the cardboard trees hanging off the mirrors of a million cars. On the car were the words Magic Car and it offered (as first of a series of scents) PETROL. 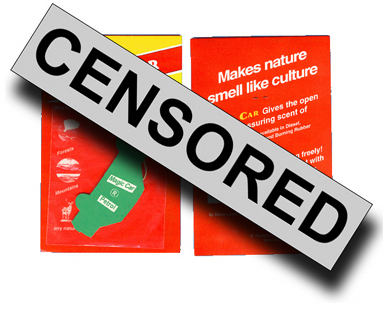 The packaging identified it as a Magic Car Air Polluter and promised to “make Nature smell like Culture”. It was made in an edition of 100 and a fair few were sold via Grizedale’s gallery and other channels. It was a reaction to working in the studio at Grizedale next to a car park and - in the middle of a huge forest in a supposedly rural setting - having to breathe the exhaust fumes of countless cars or being forced off country roads on my bicycle by drivers in huge 4-wheel drives and people carriers usually laden with a collection of bikes on a rack. A year and a bit after I finished the Grizedale residency, I got a letter from solicitors representing Saxon Industries (the makers of the “Magic Tree” air “freshener”) telling me to “cease all further dealings in the “Magic Car air polluter” forthwith” or face legal action. Apparently the public might be confused and this would cause damage to their business reputation - obviously motorists can’t tell the difference between a car and a tree... I’m a reasonable sort of person (and they had solicitors) so I signed a document promising to destroy all the remaining Magic Cars and never to do it again. Via an announcement on my website and the pages of Art Monthly and AN I did a "product recall" asking anyone who may have bought a Magic Car to burn it forthwith and send me the ashes. In return they receivde a copy of the updated Not The Magic Car multiple consisting of the ashes in a bag with a facsimile of my undertaking to Saxon Industries, a copy of their solicitor’s letter and signed and numbered certificate of authentication. Actually it made a story and Saxon Industries came out looking worse than I did so what do I care!